Before traveling to North Carolina this past weekend, I went to the Transportation Security Administration�s Web site and printed out the official flying-with-breast-milk rules. I grabbed my handy-dandy yellow highlighter and circled the important part�the part that says I can fly with however much breast milk I feel like sans baby. I folded it up nicely, and slid it inside my cooler of mama milk. Lo and behold, I�m ready to go through security when the good people at the Wilmington airport asked where my baby was. 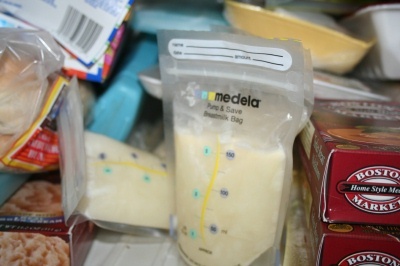 �You can�t travel with breast milk with out your baby,� they say. �Not true!,� I declared as I handed them my printout. I silently steamed as a small group of security people looked the paper over. They return. While I was very pleased with myself, I couldn�t help but be pissed. What about all those moms who didn�t have the printout? Did they dump their milk? The milk they spent so much time extracting with their crappy travel pumps, locked in a back bedroom, with a very old and very mystified cat sitting next to them. If I had to pump-and-dump, man, I�d be in a holding cell right about now.